Claudette Colvin: Twice Toward Justice by Phillip Hoose. Melanie Kroupa Books, an imprint of Farrar Straus & Giroux Books for Young Readers. 2009. Brilliance Audiobook 2009, narrated by Channie Waites. Reviewed from copy provided by Brilliance Audiobook. Nonfiction, ages 12 and up. About: Montgomery, Alabama. March 1955. Claudette Colvin, fifteen, refuses to give up up her seat on a bus to a white woman -- nine months before Rosa Parks's similar refusal leads to the Montgomery Bus Boycott. Why is Rosa Parks remembered, while Claudette Colvin is not? The Good: Colvin's spur-of-the-moment refusal to give up her seat to a white woman was inspired by a growing sense of rage, anger, and injustice at segregation laws. Her refusal to stand does not lead to the Montgomery Bus Boycott; rather, it's the actions of Rosa Parks. Colvin's story doesn't end there; in 1956, Colvin, not Parks, is one of the named plaintiffs in the case of Browder v. Gayle. Browder ruled that public transportation segregation was unconstitutional, a decision upheld by the United States Supreme Court. Claudette Colvin is brilliant. Hoose brings to the reader's attention an area of history that they may not know about. While it's an accomplishment for a writer to uncover the untold story and the undiscovered facts, that is not reason enough to call a book brilliant. It is brilliant because of how Hoose uses those facts; how he tells the story. 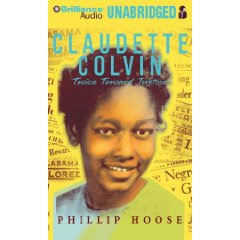 Hoose weaves Colvin's words throughout the book; the teenager's passion and immediacy shines through, even though Colvin told him her story decades later. Because this is not strictly a memoir, or Colvin telling her history, Hoose is able to present information that Colvin wouldn't have been aware of. He uses quotes from a variety of people, along with sidebars to provide additional information and background. In telling Colvin's untold story, Hoose also tells the untold stories of others. The other men and women who refused to give up their seats before 1955. The men and women who were working for years to defeat segregation and secure equal rights; oh, of course there is Martin Luther King Jr. But there is also Clifford and Virgina Durr, Edgar Nixon, Jo Ann Robinson, Fred Gray. Now, let me put on my law hat and adult hat. I love the strategy that goes on behind the scenes; how the decision makers in Alabama knew that a bus boycott was going to take place, had it all organized, and were just waiting for the right moment to start. At the same time, it's not all orchestrated; Colvin's impulsive actions, unconnected to and not influenced by any of the Montgomery activists, inspired them to go for more and to reach further -- demanding the end to segregation rather than just better segregation. While the bus boycott was an amazing accomplishment, it did not bring an end to segregation on buses. A lawsuit did that. A lawsuit. The former lawyer in me gets all gushy when I see the beauty, drama, and importance of the law portrayed in a book. Teens may sympathize with Colvin's rejection -- her not being used as the trigger for the boycott; the Montgomery civil rights activists not staying in touch with her or offering support after her testimony in the Browder case. But me? I don't know whether it's because of my law background, or not being a teenager anymore, but I understood why Colvin wasn't used to start the boycott. I understood why no support was offered to her or her family after the case and boycott ended. Oh, some of it was about Colvin. A young teen, unknown, from the not so good part of town who ended up an unwed mother. But it was also because, while for Colvin this was something oh, so important -- for King, Robinson, the other adults, it was just one part of a bigger picture. They never consciously stopped seeing or supporting or thinking about Colvin. Rather, the next thing was happening, was already happening, and their attention was elsewhere. Other plaintiffs in other landmark cases could, no doubt, tell similar stories. It's because of this part of Colvin's story -- the exclusion, the being left behind -- that I think Claudette Colvin should be required reading in law schools. When working on those landmark cases, a thought also needs to go to those plaintiffs and what they need beyond being part of a lawsuit. How does this work as an audiobook? Thanks to the brilliant Channie Waites, it is edge of the seat, listen another few moments. Waites's voicework is impressive, because one moment she sounds like a teenage girl from Montgomery; then, for a quote, a grown man; and in between -- well, I kept calling the non-Colvin parts "the narrator." I know this book is chock-full of photographs, and I want to find the actual book so I can see them; but the text was so seamless, and Waites so inviting, that I didn't miss them. Of course this is a favorite book read in 2009! As a round 2 judge for Nonfiction MG/YA, I'm looking forward to reading this one -- whether it gets shortlisted or not. Coincidentally, I was introduced to Claudette Colvin the first time I was a judge. She was in the book Freedom Walkers, which won in 2006. I appreciate your insights into what makes this book work so very well. I read it as a YA enthusiast as well as a researcher who seeks to gather people's stories, and from that perspective in particular, I thought Hoose did a masterful job. You helped me to better articulate why.